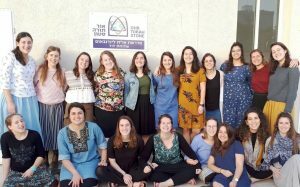 OTS’s Midreshet Lindenbaum College for Women opened the doors to its newest branch, Midreshet Lindenbaum Lod, in late August 2017. In addition to becoming the first midrasha for young religious women in the center of Israel, Midreshet Lindenbaum-Lod also answers the growing demand for post-high school programs for women which integrate Torah learning and army service, allowing the college to accept greater numbers of applicants who would otherwise have been turned away due to limited space on the Tilles Campus. Like the Jerusalem flagship school, Lindenbaum-Lod’s focus remains on intensive Torah study, but the learning additionally connects to a social and communal agenda. A course on the first chapter of the Babylonian Talmud’s Bava Batra, for example, will not only study the ancient rabbinic discourse that relates to charity but also serve as a means to address contemporary issues. This approach stems from the belief that Torah study which is connected to action and reality will reside within the hearts of our students long after their seminary year is over, accompanying them during their ensuing military service and continuing to inspire them for the rest of their lives. Weekly volunteer service with the weaker populations in the Lod community is built into the curriculum, as well. In addition, Lindenbaum-Lod opens its doors to the community at large every Tuesday night, inviting adult women to take an active role in the beit midrash. Young residents of the city – particularly those from low-socioeconomic backgrounds – are paired for chavruta learning with the Lindenbaum-Lod students. Ultimately, the goal is to instill in our students both the desire and the ability to grapple with contemporary issues and address the dilemmas which arise from modern religious life.